Booking for this trip was very simple. 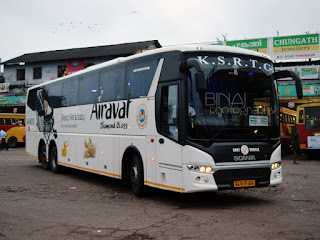 There are only two options on this route - Karnataka RTC's Airavat Club Class and two services by Kallada Travels. I quickly glanced at the fares, and decided to go with Airavat Club Class - it was around Rs. 300 less than Kallada, plus the benefit of being able to board from a bus station. 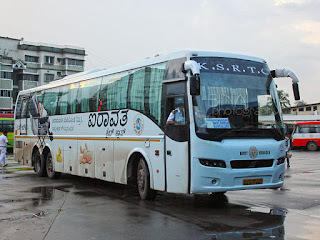 Booking through the KSRTC website is a breeze, plus the mTicket is an added advantage. Sometime around 8pm a message with the crew details popped up in my phone. The departure time at Thrissur was 2240hrs. My dad was to drop me at Thrissur - I reached Thrissur by around 2200hrs. I was at Thrissur bus station after a very very long time. Nothing had really changed here - its still crowded like hell. I had a long time to go and just kept wandering around. My bus, KA-01-F-9343 of Mangalore Depot-2, turned up at 2251hrs - 11 minutes behind time. The bus did not pull up to the platforms - infact, there were no empty platforms - but he just stopped near the entrance itself. Just as I walked towards the bus, the driver moved it a bit more closer to me. The conductor asked my seat number, and let me in. As soon as I was in, the bus the got moving (2253hrs). They did not try to attract more passengers. The driver meant business - he picked up pace quickly, and we were off towards Mangalore. KA-01-F-9343, of Mangalore-2 Depot, after dropping me at Mangalore. The conductor came around to check my ticket sometime later. Three passengers got in from Thrissur - two reserved, and 1 unreserved. He checked the two tickets and issued a ticket to the unreserved passenger. A while later, he came with the blanket and water bottle. Lights were turned off, while the driver got busy handling typical Kerala traffic on the busy 2 laned state highway towards Kuttipuram. We would join NH17 (now NH66) at Kuttipuram. I dozed off for sometime, and woke up just as the bus stopped at Changuvetty to pick-up a passenger (0021hrs) - this means we did around 80kms in around an hour and a half - not bad for a two lane road. I slept off as soon as the lights were turned off. 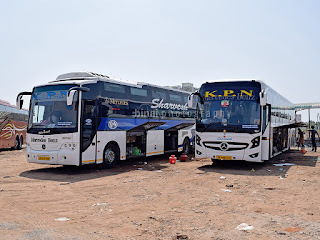 I had another short sleep, and woke up only when the bus stopped at Kozhikode bus station - the bus was already stationary when I woke up. The bus got moving at 0130hrs from Kozhikode. It was my first visit to the new Kozhikode bus station - but couldn't enjoy much of it, since I was half asleep. I slept off even before the bus left Kozhikode city. As usual, the driving was perfect - no hard braking, no honking, no rash cuts. I work up only when the conductor called out for Kasaragod passengers. Only one passenger got off here - he was dropped outside the Municipal bus station, at 0520hrs. This meant we were running over an hour late already! The road after Kasaragod was not in good shape - it was a rough ride after Kasaragod. I couldn't sleep after Kasaragod because of the bad road. We picked pace whenever the roads were good. 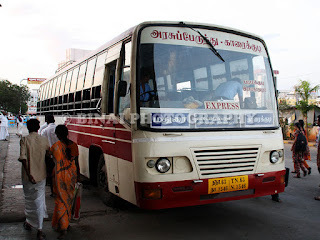 The bus stopped at Thokkottu at 0610, where a couple of passengers got off. I pulled up my backrest and prepared to finish the journey. The bus then stopped at Pumpwell (0618) and finally dropped me at the Mangalore KSRTC Bus Station in Bejai at 0626hrs - almost an hour late. The 7h35m ride averaged around 50kmph - totally in two lane roads! The driving was sleep friendly. The bus maintenance wasn't great - there were lots of rattles, including lots of noise from the rear axles. The seats and interiors were clean - the curtains were in perfect shape as well. The rear LCD screen was missing - only the base plate used for mounting the display was present. Loads weren't great - but had just over 50% loads - but then this was a Monday night! Will I take this service again? This will surely be my preferred option when I need to travel on that route.